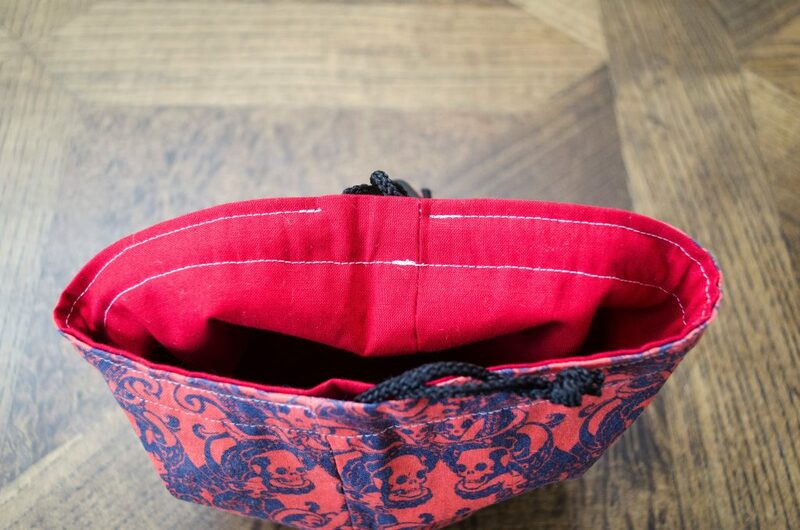 The benefit of a dice bag over whatever else you’re using is a pretty simple one: economy. 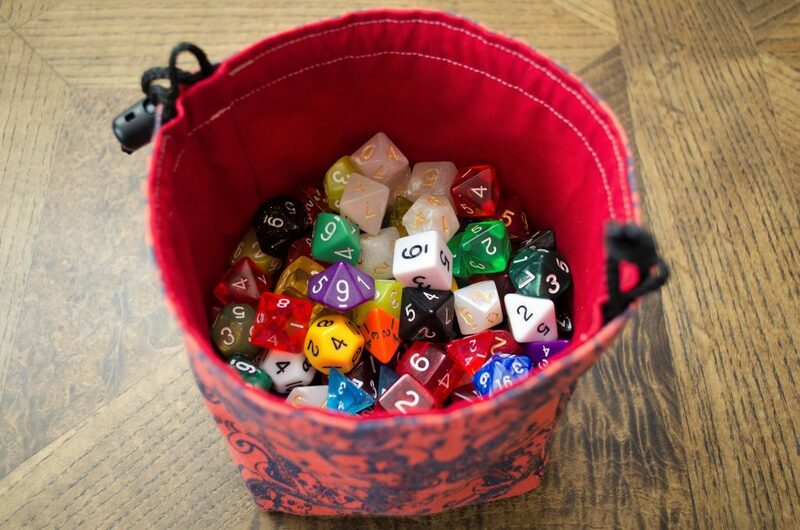 The number of dice that you can store in a single bag will always trounce any other option: thousands of dollars worth of dice boxes, tens of thousands of dollars worth of spellbook boxes, etc etc. 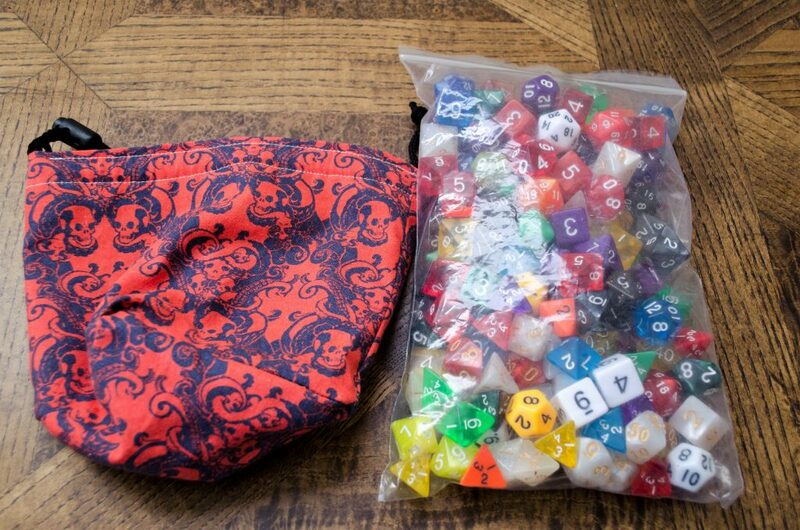 A single bag can safely store mountains of acrylic or plastic dice safely and, if you nab the right material, quite stylishly. There is only one: dice bang together. Acrylic and plastic dice won’t break from jostling each other. You’d have to throw them off a rooftop onto concrete before you ever damage the dice and chances are you’d only damage the bag. 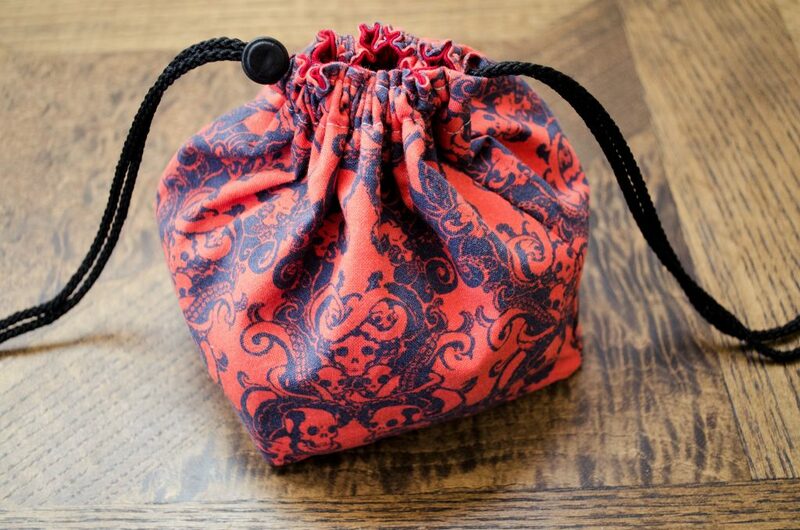 If you’re sporting metal or gemstone dice, though – do not use a dice bag for them. There isn’t enough support or enough cushioning unless the dice is made specifically for them, to make it an optimal, safe option for transporting delicate or heavy dice. They’ll scratch and chip and bang together. Despite its diminutive shipping footprint (an envelope), this bag expands to a 5×5 cube when fully open. 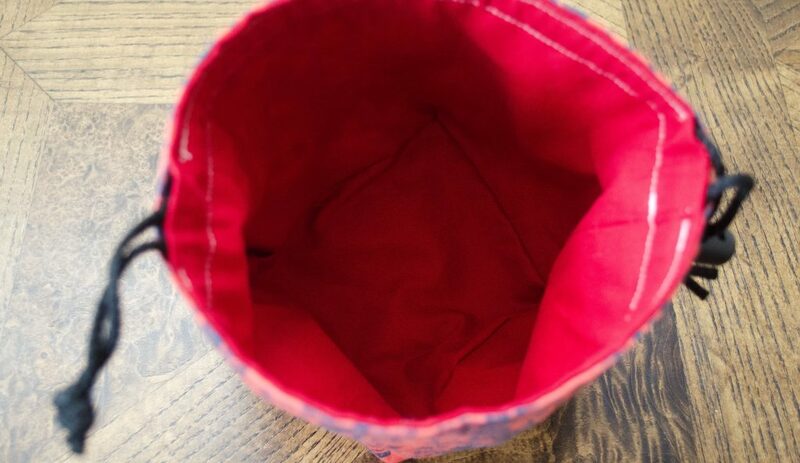 The stitching is such that the bottom remains nice and square, mostly flat, which means the bag stands upright easily. This is more than enough space for 30 full sets of dice (210 individual dice). Which should be MORE THAN ENOUGH for most of you. Laura Baileys need not apply. 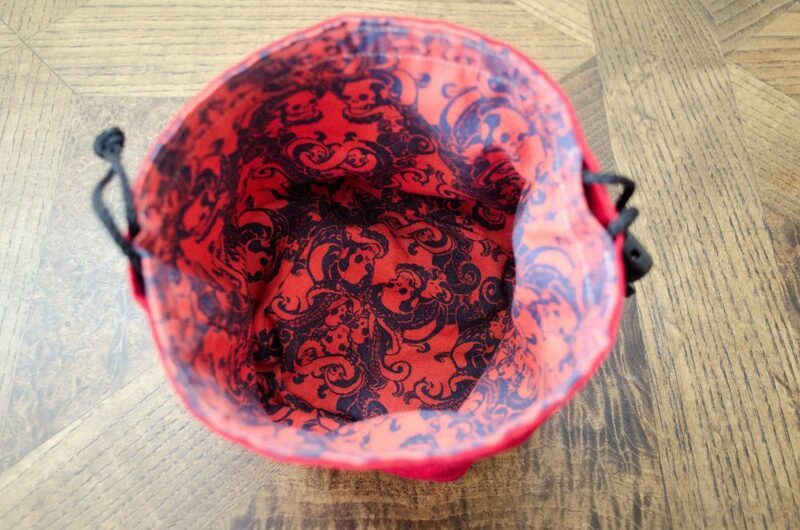 The bag, as stated, is reversible, which is great. I’m not sure if I enjoy the red on the outside or on the inside, but regardless, it’s a striking figure. 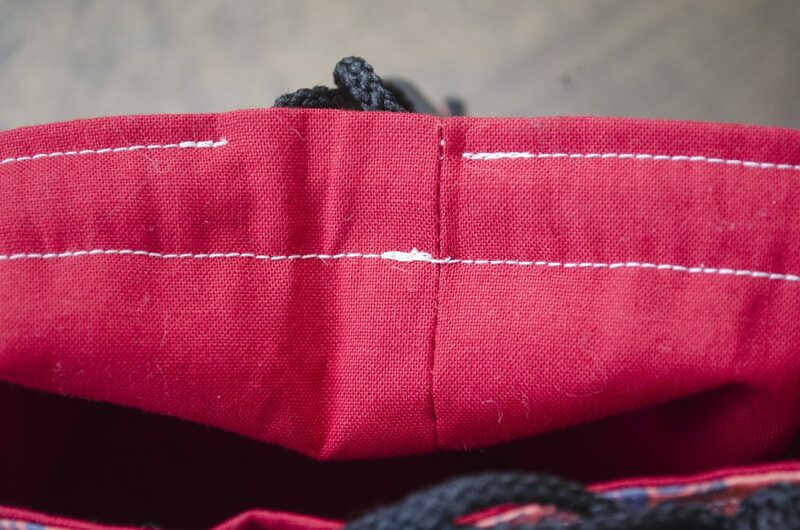 And since the stitching matches on the inside and out, even we persnickety curs will have the option of both sides. 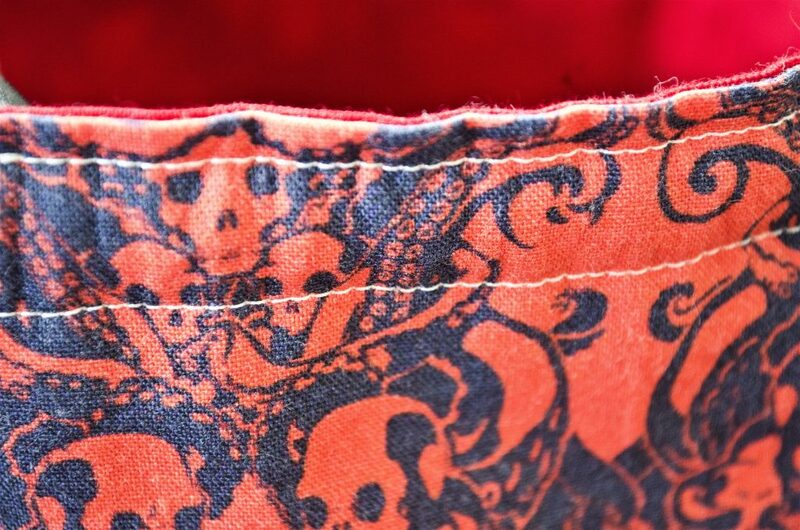 The Victorian-era style Lovecraftian fabric is phenomenal. Tentacles wrapping around vacant skulls. It’s a truly beautiful option. 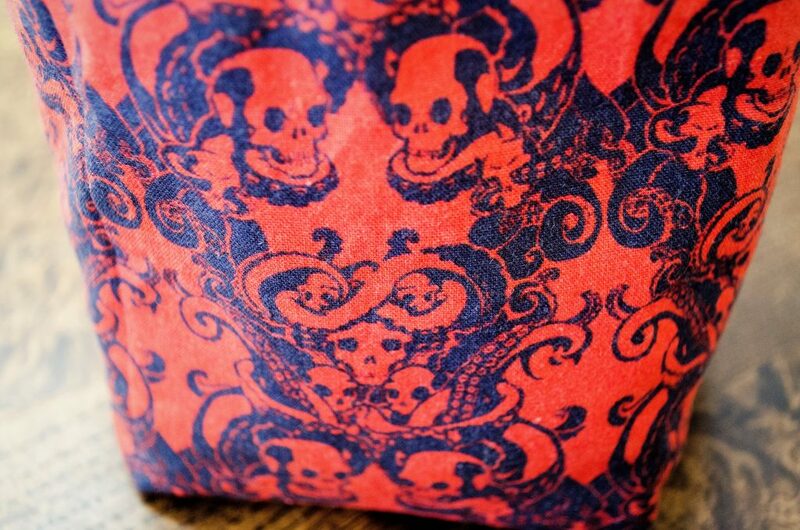 The use of near-black purple and orange fabric makes it match with nothing – a neutral vessel for your dice horde. Grey goes out of his way to collect and use such interesting fabrics, which you will not find from larger companies. Small batch dice, small batch dice accessories, you know it’s my true love. 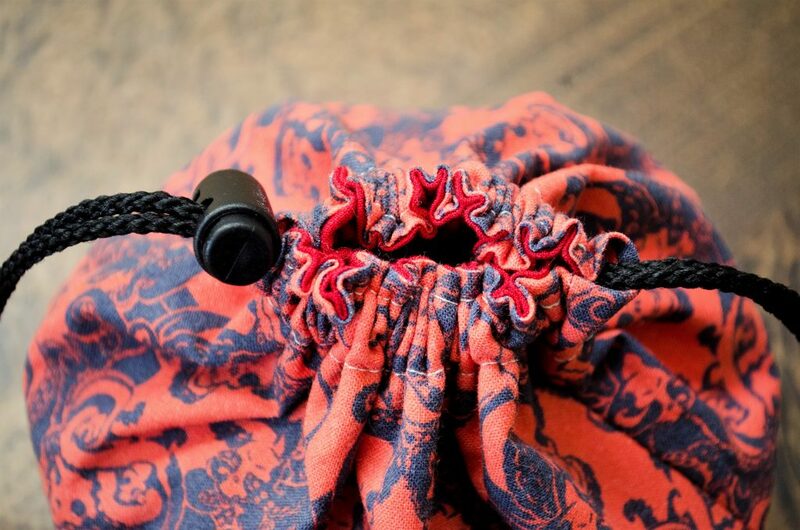 Heavy duty nylon cord encircle the top to cinch the bag closed, held with an additional plastic spring clasp. These are pretty standard in the industry, but I do like that Grey uses a much smaller diameter cord. 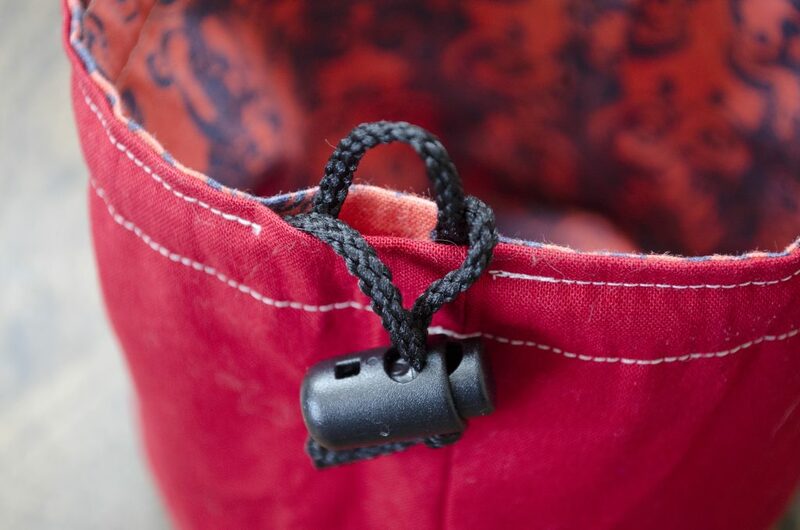 We’re not hanging from a ledge by it – so this smaller cord makes for a much easier time opening and closing the bag and provides a much firmer, tighter aperture to prevent dice from spilling out in transit. The turning point for many potentially great products, the overall quality of assembly. You’ve heard me harp about “mechanical fastenings” and “clasps” on wood products, but stitching is absolutely paramount on any and all leather and fabric products. You don’t want to spend $20-$50 on a product only to have it literally come apart in your hands a few years down the road. I’m happy to report, Grey has put a phenomenal amount of effort into ensuring the stitches for these bags are top quality. I have no threads to pull, no weak stitches, I see no vacant spots. Turning the bag inside-out and inside-out again didn’t loosen anything. 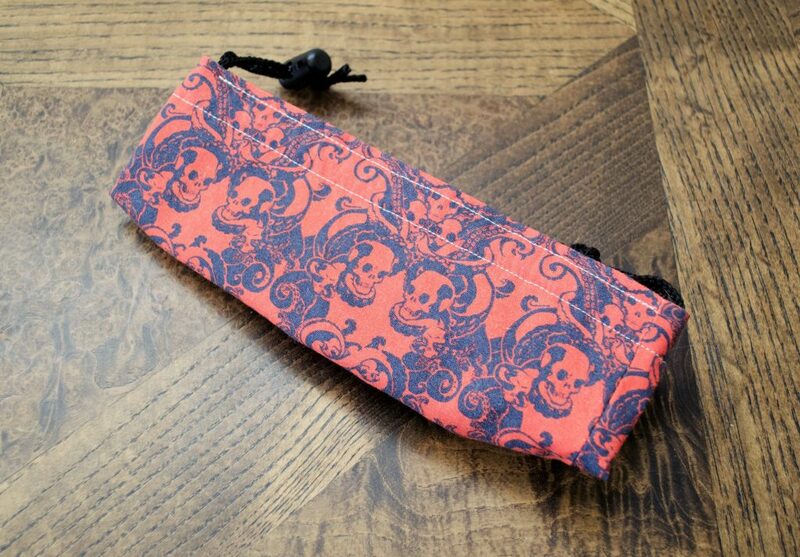 I have to admit, the stitching here beats out my previous favorite dice bag (the EasyRollerDice Co Wyvern Bag). Sincerely, impressive work. If you notice any fine white and gray hairs in this photo, it’s because my buddy Grey owns 2 cats. Now I, being practically blind, didn’t see these before the photo shoot, but afterwards I figured I’d report on my findings. This particular material (which feels closer to canvas than cotton, a higher quality “Kona Cotton” material). Unlike the microfiber bags you’ll find on offer at many other, larger, companies, this fabric is incredibly easy to clean. Dust, hair, whatever – I brushed most of it off with my hand and the rest came of with a little bit of tape or a lint roller, where the microfiber bags took me AGES to get clean. Huge bonus points that the cotton material is safely machine washable, though you may want to hang it to dry – I’d never risk a clothes dryer. So if you have a horde of pets flying about, that may be a good selling point for you! 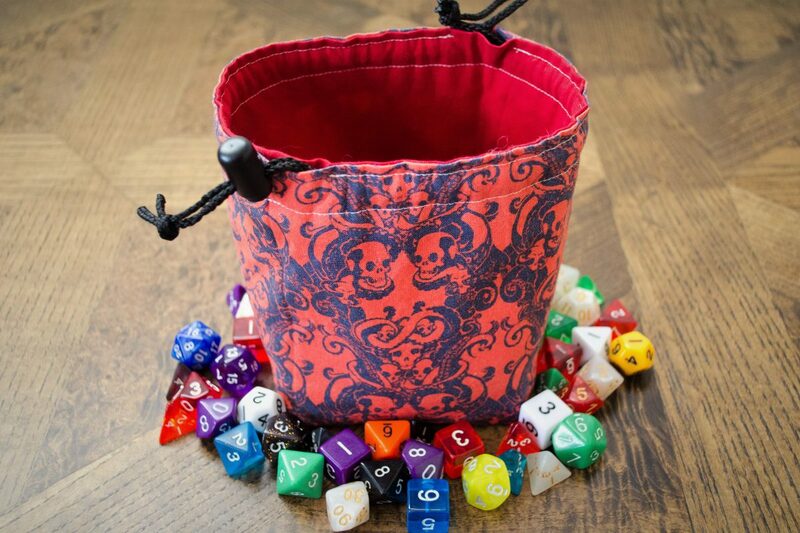 There are very few, if any, options for storing your dice than dice bags. And at around $10 for small versions and $35 for the largest most extravagant offerings, Greyed Out is doing work you should not ignore. Very high quality materials, fantastic assembly, thematically robust and interesting artistic choices – there’s no discernible downside to these dice bags.